Home / Faith / Who Else Wants This Kind of Hairdresser? 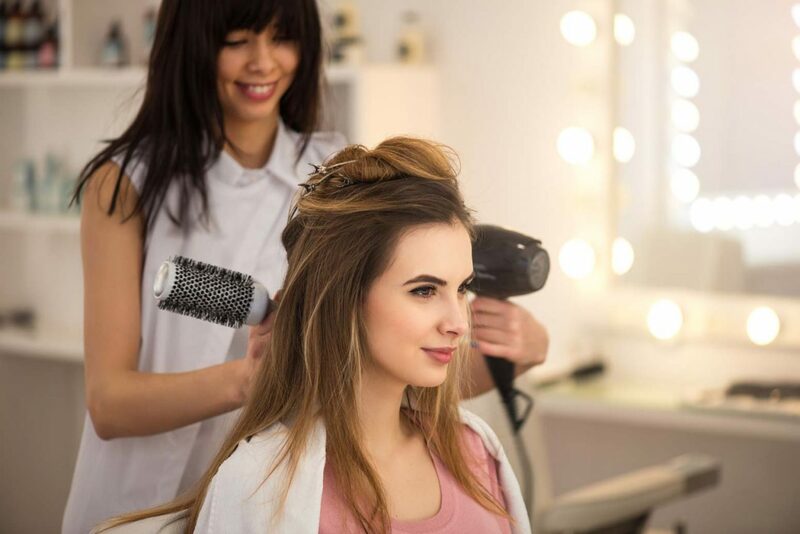 You have heard it said that behind every beautiful woman is a hairstylist who loves her. We will get to that in a minute, but first, sister, come on in and let me pamper you. Picture yourself walking into my cute, little cottage-style salon named Thairapy where you’ll see me greet you with my dimpled smile, offer you a chunk of chocolate (yes, I said chunk, because who wants just a little measly piece? ), and a cup of coffee. I’ll get you settled in my chair that allows has an awesome view of my cute little pond and gorgeous Kansas landscape—a sight sure to relax you on the spot. Like, take-your-first-deep-breath-of-the-day type of relax! We’ll talk about your hair for sure, but the rest of the time? We’ll talk about your life because, to me, it’s about more than just your hair! I’ll listen as you release all that is pent up: the work sagas, the home chaos, your everyday life! You’ll update me on your kids or grandkids, what’s going on, and how they’re driving you crazy. We’ll talk about your husband or whatever your current man situation is and how he is driving you crazy. I will keep working away as the conversation flows into the deeper things—what’s on your mind or why your heart is hurting (hold up, let me get you a Kleenex and another chunk of chocolate). You will feel safe to share about the crappy day or week or month you’re having and, all the while, I will be saying a silent prayer, asking God to give me words to somehow encourage and help you! It is for sure, 100% about more than just the hair, it’s about you. Yes I’m doing your hair, but all the while, I will be saying a silent prayer, asking God to give me words to somehow encourage and help you! These moments are about more than just hair. I recently shared my Thairapy passion at a career event to several high schoolers who are considering cosmetology as a profession. My presentation started with the admission that when I was their age, I knew exactly what I wanted to be—a hairstylist! I couldn’t wait for the day I would graduate, when I would be able to jump into a glamorous career of playing with hair and making women feel more beautiful. That’s what I wanted to do, but it took over a decade into my job to pinpoint why I love it so much. It’s the clients and tending to the heart and soul that’s under the hair. I love walking through life with them! I have seen them on their best and worst days, and they’ve seen me on mine. I’ve shed tears with them through death, disease, and divorce (sometimes all with the same client!). Recently, I had just gotten all the foils and color on a client’s hair, so I sat down and listened while she told me about losing her dad. I wept with her as she recalled the details of sitting in the hospital room listening as her father and hero took his last ragged breath. Heart-wrenching grief followed by hope-filled relief because just moments later she looked out the hospital window and noticed a beautiful sunrise that took her breath away. It was like God painted the sky extra special to welcome him home and to let her know that’s it’s okay, he’s not suffering anymore, he’s home! It was one of those Thairapy sessions where I recognized that I didn’t need to say anything or offer any counsel… this woman that I’ve grown to love just needed to talk about it and get it out of her head. I was honored to know that she trusted me enough to expose her grieving, hurting heart. It’s about more than just the hair. I was honored to know that she trusted me enough to expose her heart. It’s about more than just the hair. I love to do a little happy dance when my clients share about their new jobs or new adventures, cheering them on while they go after their dreams. I’ve cried many happy tears and shared many goofy grins in celebration of the good moments with my clients—news of engagements, marriages, and pregnancy (not only am I often one of the first to find out but I’ve actually been in the delivery room to see one of my clients give birth to a healthy baby girl!). Ahem, well, you can do the math. I had no idea that my flippant words would point to the reality that God had a big surprise in store—their family needed one more member to complete them. I also had no idea how beautiful and powerful it is to witness childbirth, to see this strong woman endure pain and push new life into this world. It was an absolute honor to be there by her side in such a monumental moment of her life! Oh yes, it’s about way more than just the hair! It’s about people, building friendships, and sharing hearts. The relationships I have with my clients are more than just a business exchange; it’s an interweaving of lives—it’s intimate and personal. Moments that are raw and real, with the vulnerability that is strengthened by encouragement, a hug, and some hairspray (and chocolate). I believe that deep down, the real reason why I am so passionate and so honored to do life with my clients is that I love to mirror another powerfully intimate relationship: the one between you and God. Listen, this is where I would put my shears down, lean my curvy bum against my station while I grab your hand, look you in the eye, and share my heart, because I really, really want you to get this. You are a strong, beautiful woman, and there is a God behind you who loves you. It’s more than just a business exchange for Him too; He’s in it for more than just your ticket to Heaven through salvation in Jesus Christ. Girl, He interweaves His Spirit with yours—He’s in it to do life with you too. To walk beside you and cheer you on. To weep when you weep, laugh when you laugh. He will be there through the ups and downs of life and, all the while, He will be supplying every ounce of grit and grace you need to get through one more day. It’s about more than just religion, it’s about a relationship, and I promise that you can trust Him with your heart just like you trust me with your hair. This love He has for you is personal, powerful, and better than any Thairapy session I can give you! The relationships I have with my clients are more than just a business exchange; it’s an interweaving of lives—it’s intimate and personal. A Kansas girl, Jodi is a hairstylist and woman who loves marrying her passion for helping women look and feel their best with a good dose of hope in her writing.